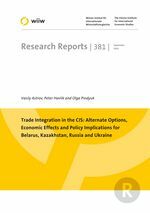 A functioning Belarus-Russia-Kazakhstan Customs Union (BRK-CU) would comprise the bulk of the FSU economy and represent a significant step towards an attempted re-integration of the FSU – even more so if Ukraine were also to join. There are still important structural differences in intra-regional compared to extra-regional trade of these countries, regarding exports in particular. The existing specialization patterns and comparative advantages may – apart from purely political considerations – provide some economic rationale for closer trade integration. Our difference-in-difference gravity-based estimates indicate that during the period 1999-2009 liberalization took place primarily in the trade of Belarus, Russia, Kazakhstan and Ukraine with third countries, whereas in their mutual trade barriers in many manufacturing and services sectors actually increased. The BRK-CU largely eliminated the remaining non-tariff barriers in mutual trade and, upon the adoption of a Common External Tariff (CET) in 2010, unified the participating countries’ trade policies vis-à-vis third countries. As a result of CET adoption, the average (un-weighted) level of protection declined by about 2 p.p. in Russia and 1.3 p.p. in Belarus, but increased by around 2.5 p.p. in Kazakhstan. Available estimates of the economic effects of the BRK-CU differ by a wide margin. Our computable general equilibrium (CGE) estimation results suggest that joining the BRK-CU might potentially bring net GDP losses to Ukraine. BRK-CU membership appears to bring net GDP and welfare losses also to Kazakhstan whereas Belarus and Russia benefit in terms of GDP and labour income growth. There seems to be little (economic) justification for Russia prompting Ukraine to join the BRK-CU. Ukraine, on the other hand, is likely to have a significant increase in GDP and real labour income after implementing the DCFTA with the EU.